Welcome to my site!! I'll include everything I know about my favorite movie: The Lord Of The Rings!! Like news and gossip, photos, show reviews, and more!! For many years, fans across the world have dreamed of the day when The Lord of the Rings trilogy, writen by JRR Tolkien could be brought to life on the screen. And now Peter Jackson made their dreams come true. He made the three movies in two years. The first movie 'The Fellowship of the Ring' is now on DVD, 'The Two Towers' will be in cinemas this Christmas and 'The Return of the King' next year Christmas. The story is about a hobbit called Frodo, who owned the one ring from his eldery cousin Biblo. Frodo must destroy the ring of evil, in the mountains of Mordor. 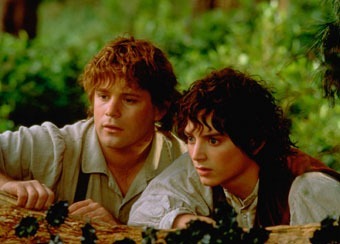 Sean Astin and Elijah Wood as Sam and Frodo..! !